Sennheiser SP 30/30 + - - Sennheiser SP 30 is a portable wireless speakerphone for personal conferencing or up to 8 people. 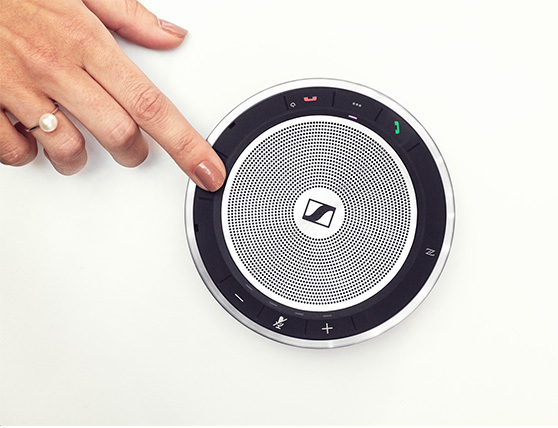 Natural conversation experience and exceptional audio performance with Sennheiser’s renowned sound quality via Bluetooth® or USB-C.
Sennheiser SP 30 is a portable wireless speakerphone for personal conferencing or up to 8 people. Natural conversation experience and exceptional audio performance with Sennheiser’s renowned sound quality via Bluetooth® or USB-C.
With lightweight design, choice of Bluetooth® or USB-C plug’n’play and multi-point connectivity with up to three devices and one touch access to Voice Assistant. With Sennheiser Voice Clarity, ultra-low distortion speaker and echo and noise-cancelling microphones supported by highly advanced DSP algorithms. With industry-leading duplex performance that allows simultaneous speak. With premium materials, convenient cable winding and safe dongle storage.